Photo: Barber-Pittman House, ca. 1915, 416 North Ashley Street, Valdosta, GA Listed on the National Register of Historic Places in 1980. Photographed by User:Ebyabe, 2010, [cc-by-2.5 (creativecommons.org/licenses/by/2.5/deed.en)], via Wikimedia Commons, accessed June, 2015. 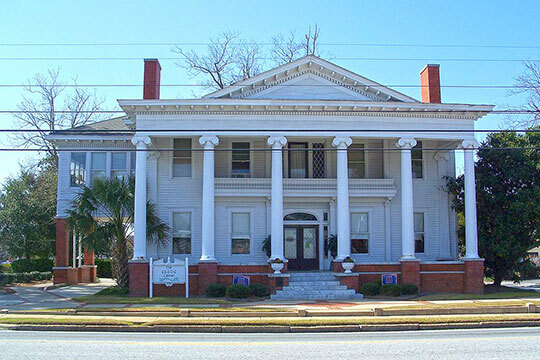 Lowndes County administrative offices are located at 327 North Ashley Street, Valdosta, GA 31601; phone: 229-671-2400. Lowndes County was created in 1825 from parts of Irwin County. It is named from William J. Lowndes [1782-1822], a lawyer who served as U.S. Representative from South Carolina from 1813 to 1822. Through 1856 Lowndes lost up parts of its territory with the formation of Berrien, Clinch and Colquitt counties.